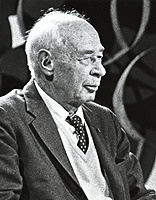 Henry Miller's literary works rely heavily on the autobiographical and the confessional. So it should come as no surprise that the 77-year-old writer offers an intimate and revealing look at his life and work during this wide-ranging conversation, which originally aired on Quebec television in 1969. Interviewed by the perceptive Fernand Seguin (who repeatedly lights his guest's cigarettes), Miller speaks frankly about the suicidal despair that led him to write Tropic of Cancer, his "disgust" with readers who bought the Tropic novels for their pornographic value, and his years of poverty - begging from friends, strangers, and even the mailman. For a man whose work helped change the definition of obscenity, Miller is remarkably phlegmatic on the subject, saying that the question "doesn't interest me in the least." Instead, he prefers to judge writing purely on its aesthetic merits. Asked about people he admires, Miller points to clowns, stand-up comics and "hobos." But he also discusses the writers he admires, particularly Blaise Cendrars, Jean Giono, Celine, and British adventure writer Rider Haggard (a low-brow choice that dismayed British critics). Miller speaks in enthusiastic but accented French, embracing contradiction throughout the interview. He believes America is on the brink of destruction, but enjoys his heated swimming pool and other material comforts. He is a hero in the fight against censorship who thinks society has become too permissive. 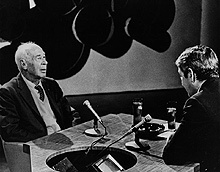 Seated on a stage, in front of a screen projecting images that offer their own commentary on the conversation, Miller appears relaxed, comfortable with himself, and open to the possibilities of the future. The purpose of life, he says, is to become our true selves over time. Clearly, he is a man who has changed since he wrote Tropic of Cancer because, as he puts it, "The only thing left was to write a book about my utter failure and the world falling to pieces around me... to set down my despair on paper." A charming program from over 40 years ago: Jack Kerouac talks about his childhood, writing On the Road and the origin of the word "beat."